Writing this has forced me to analyse exactly what I understand about visual literacy myself, and why I teach the way I teach. I’ve done my best to structure this into a presentable case, but acknowledge and apologise for what still reads like a ramble to me, with gaping holes, dead ends and clumsy hedge-hopping. The idea of visual literacy emerged in the 60’s, widening the definition of text to include the non-verbal. The everyday written word and printed page was recognised as a relatively recent phenomena, both originally defended by a powerful literate elite. A multimodal communication existed long before widespread written literacy; Colour, pattern, ornament, images, symbols, stained glass, alongside ephemeral storytelling, acting, music and songs; they are all forms of communication. Corinthian columns aren’t there to hold the roof up, they are there to mean (my Dad taught me that). We now also hear talk of being ‘computer literate’, though I’m unsure what this really means beyond having a level of competency. To be ‘media literate’ though, suggests an understanding of the language, ‘grammar’ and sources of advertising and news media, and a keen or often sceptical awareness of the motivations behind them. Film and TV now combine many of the early modes simultaneously as time-based texts. Filmmakers also seem to have a strong grasp of formal ideas borrowed from Fine Art; framing, cropping, composition, contrast, scale, and negative space for example. How films mean is a long way from how words mean and communicate. In between the two somewhere though, are comics and kids picture books. These forms of visual storytelling provide a natural starting point for the pre-literate child and early readers. I’ll come back to this. So first off, what is Literacy? Ask a primary class, and they’re likely to respond as most of us probably would, with reading and writing. Literacy seems such a school word; a term they (and most of us) are unlikely to encounter elsewhere in ‘real life’ (just like PE or nativity plays). It’s a set of specific skills now so tightly and joylessly dictated that even the teacher rolls their eyes, just wishing it over and done with. If we permit a loosening of definitions, we allow more room to manoeuvre, and literacy starts to become something more significant and expansive. So let’s ask the class “are there any other kinds of reading?” - hands will go up when asked who can read a map, and the recorder players can share that they are learning to read music. Fortune tellers read palms, someone points out. Early on we develop an emotional literacy that enables us to read expression in faces. We might also read a room or situation, collecting fragments of information to develop an opinion or analysis, like a detective reads clues. Progressive teachers in the 70’s were arguing for the merits of speech as an essential component of children’s literacy. Isn’t it in the conversations, discussions and exchanges in class where we identify discovery and learning? When we vocalise and articulate, we are literally thinking out loud; ruminating, exploring, testing, defending, reconsidering and dismantling hypotheses. A child resistant to opening a book might still communicate intelligently, or record and edit an interview with a grandparent, or exercise language without putting pen to paper. In reality, the nearest they might get to this being valued in school is having to write ‘persuasive’ arguments (but to persuade who? ), and secondary school essay titles demanding they ‘discuss’ statements on other texts, (but just so long as they don’t confer with others). So if we recognise an expanded definition of reading, what does that mean for writing (and, as I argue, speaking)? Is it useful to know the word text originates from the Latin for ‘woven’, like a textile, composed of threads, a tactile (textured) but wordless object? Do we weave words to create a composition? Spells are woven; the word glamour (in the sense of magic and enchantment) is of the same root as grammar (in the sense of scholarship and learning that once included alchemy and the occult). Kids might have composed a poem, or something as mundane as a list, but never thought of stories in those terms. Written or spoken, we compose a sentence just as a musical composer might; selecting and arranging elements into an expressive, coherent order, appropriate for the wider context of paragraph, argument, story, or melody. Similarly composing a map requires the mapmaker to articulate and describe a terrain. But what of composing a face? Somehow that suggests either deception (“compose yourself”, i.e. hide your true emotions or “get your story straight”) or a performance, acting out an expression for an audience. Cartoonist Chris Ware keeps his faces essentially blank and unexpressive, as “faces lie all the time,” so he’ll use text, colour and locations to set the mood. As soon as a ‘text’ has been composed it can be recorded in some form, whether as ink on paper, pixels on screen or sound on tape. Anything recorded is then in a position to be altered, edited, misquoted or pastiched, by re-composers beyond the original one(s). So what am I getting at, and what happens in practice? I’m circling in on what this means to me when approaching visual literacy with kids and in schools. Over the past ten years I’ve been visiting schools (mainly Y5 & 6 primary) running Create Comics workshops. They don’t need to understand what a multimodal texts might be, but while I’m in class teaching basic comics skills, they can be introduced to the idea of reading and composing pictures, using words for speech, thought and narration, and creating sequences. It’s rewarding to see the kids who might be reluctant readers or writers, or unconfident drawers, gain creative skills and proudly share successful work. All the drawing games and exercises I lead in class aim to actively engage everyone in articulating visually, and despite the restricted timeframe of a single school day, we cover a lot ( and I describe them below). One general point that I like to make to the group is that they are a group. Creating comics is typically a very solitary pursuit, working in isolation and sharing nothing other than the finished product. In contrast, while we are here in this or whatever room drawing together, we have the benefit of other’s opinions and sets of eyes. We can ask each other “do you think my drawing is working? Can you tell what that is there? Does this look like tears or sweat?”, and we can suggest “why don’t you zoom in on that character because we don’t need to see what her feet are doing?”, or “this bit is confusing for me, as there’s too much going on”. I like to show them a lot of examples from existing comics. I’ll get any overambitious ideas disregarded early on; forget about Batman’s muscle structure and dramatic foreshortening, let's aim for clear, simple and even crude (and I’ll show Charlie Brown, Finn & Jake, and Peppa Pig). Right from the start they need to know that it’s not about drawing skillfully, beautifully or realistically, but drawing clearly. Making simple images also speeds up the process, meaning they’re more likely to get more story told. We won’t use colour, because there are simple ways to make strong images with just black and white. I’ll show them manga, woodcuts, old newspaper strips, Crumb, Seth and Marjane Satrapi, then hand out a colouring sheet and just black felts. Using solid areas, hatching, crosshatching and textures, participants begin to think boldly and graphically. I like to see the teacher involved in all the activities, working beside the kids rather than marking in the corner. A decent teacher will book me at the start of term and then apply all the new skills from then on, creating comics about their science experiments, or Vikings, or bullying, or in French. So what do they gain from it all? Hopefully kids (and teachers) will find new and inspiring reading material that they might previously have dismissed as childish or facile. They’ll have a practical insight into what a creator has to consider when producing a comic (or animation, film, game, advert etc. ), plot, script, characters, costume, acting, locations, composition and so on. In terms of visual literacy, realising that drawings and images are a powerful means to communicate, and are something to read not just look at, is key. If kids can start to think to themselves “why does that image leap out at me?”, “why have the depicted it like that?”, and “what are they getting at?”, they are exercising a newly found visual literacy. Equipped and empowered with a keen understanding of visual communication, they can begin to engage with, participate in and contribute to a richer shared culture. Firstly, when covering speech and thought bubbles I’ll draw on the board a simple spoken exchange between two characters, but with the question bubble on the right, and the response on the left. Most kids will spot straight away that it’s wrong, as they’ll read the response before the question. We chat about how we read from left to right (and then top to bottom), even when it’s not ‘proper’ writing like in stories or newspapers. I’ll ask for ways to fix the confusion, and we reach the best solution which would actually be to draw the first speaker on the left and the responding character on the right. So, together we realise that speech bubbles aren’t just the thing that you add on once you’ve completed the picture; we need to think about who is saying what, and only then decide where to position them in each panel. The writing and the drawing need to be considered at the same time as each other for our comic to ‘work’ properly. We’ll also take a look at Raymond Briggs’ The Snowman, a comic disguised as a picture book, and a beautiful example of ‘silent’ storytelling where no words are needed. We might follow this by looking at a flight safety card or IKEA assembly instructions, and discuss why they chose not to use any words there either. 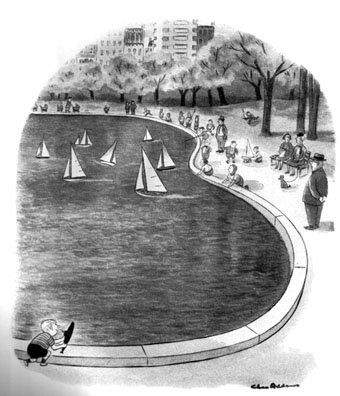 The second instance where I touch on the idea of ‘composing’ images occurs when I share a silent Charles Addams gag cartoon from the New Yorker. I’ll ask them to describe what they think is happening. “Well, it’s in a park and there’s kids with toy boats an’ that”, “and that kid there has got a toy submarine and he’s gonna launch it and sink all the boats”. They ‘get it’ straight off, and I explain to them that the reason they get it so quickly is because Charles Addams ‘composed’ his drawing so skillfully. He knows that, whether it’s a page of writing or a single picture, your eye always starts ‘reading’ up in the top left corner, whether you like it or not. So he’s put all the contextual information up there, setting the scene so that you understand straight away we’re in a park, and there’s families and kids, and they’re sailing their nice toy boats on the pond. He also knows that your eye can’t help but then follow the well defined edge of the pond shape, all the way down and around, sweeping you along to the punchline or joke. He’s given the boy (Pugsley, in fact) solid black shorts and a solid black submarine, as this is where he want’s your eye to halt; a visual full-stop. Addams has complete control over what you see and in what order, because he understands that we read images as would do sentences. The other interesting thing I like to point out is that he’s withheld the actual boat sinking from us, as he knows our own imaginations will conjure it without him having to draw it. If I’m working with secondary pupils or an adult group, I might bring in the idea of visual literacy from the start. I’ll describe taking a photo of my son out my wallet and then tearing it up. Why does that seem so wrong? - because images are incredibly powerful and magical, and have us completely convinced that a depiction of someone IS that someone. This is true of drawings too; I’ll draw a quick sketch of an old chap holding a golf club about to swing. Nobody sees lines of ink on a white surface, they all see an elderly golfer, no matter how badly drawn. We don’t even see a golf ball, but we ‘fill out’ the picture with our own active minds, adding a golf course in the background when there’s nothing there. Next to him I’ll draw an identical-looking figure, staring out into the distance with his hand raised to shield his eyes from the sun. Nobody sees two similar men; they all create a narrative in which he’s hit the ball and is now watching it’s path, although I’ve not drawn him hitting anything. Comics, even just a simple two-image sequence, is an active medium that only comes alive when you read it, filling the gaps and making the connections in your head which just doesn’t happen when you watch TV (TV doesn’t need you there; think of a telly on in an unoccupied room). With kids and adults, the most successful (and fun) exercise I use is a great way to reinforce the seemingly obvious point that everything they ‘read’ has been composed, just as everything they compose can be ‘read’ by others so needs clarity. I don’t take credit for inventing this game, having seen different versions and first learnt it from Steve Bissette at the Center for Cartoon Studies. The game; two sets of cards, one naming different animals, the other set listing various jobs, hobbies and activities. Each participant is given one of each, which they must keep hidden from those around them, then given 5 minutes to draw their animal doing their activity. I gather them in and the one-by one share them at the front and we try to guess the two words. After a first round of this, What becomes clear to participants is that the game is not about being good at drawing, but being clear at drawing. The least confident artist in the room can create the most successful, easily guessed drawing by simply considering “what are people going to see when they look at my drawing?”. By the second round, almost everyone is thinking about scale, what ‘clues’ or visual information they should include, and what extraneous elements can be left out to increase the clarity of their image. Time permitting, alongside the animals and activities I’ll distribute a third set of cards which list emotional and physical states (such as ‘bored’ or ‘freezing cold’). Artists now have to convey all three words in their drawing, utilising facial expressions, body language and situations. Teens and above enjoy writing their own cards to challenge each other with, and many times the resulting characters have been the starting point for creating comic sequences collaboratively.